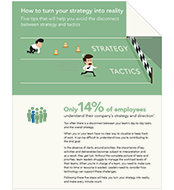 Only 14% of employees understand their company’s strategy and direction. The disconnect between their day to day tasks and the bigger picture means that too often, they don’t understand how they are contributing to the overall end goal. As a result, teams can become lost when prioritizing tasks and team leaders can struggle to manage employee workloads. Technology can support these challenges, helping to ensure no time or resource is wasted.